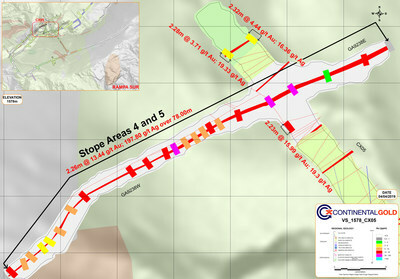 TORONTO, April 15, 2019 /CNW/ - Continental Gold Inc. (TSX:CNL, OTCQX:CGOOF) ("Continental" or the "Company") is pleased to announce high-grade channel sampling assay results from three development drifts where up to five stope areas are being prepared for production as part of the underground construction at its 100%-owned Buriticá project in Antioquia, Colombia. 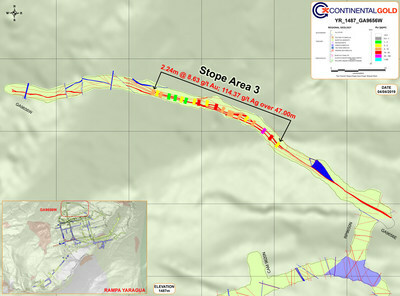 Development of the Buriticá project remains on schedule with first gold pour anticipated in H1 2020. Supporting information for results discussed in this release can be found in Figures 1-3 and all sampling widths reported herein are at horizontal metres. 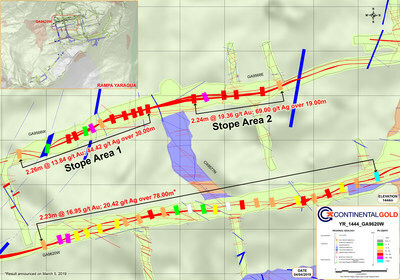 For information on the Buriticá project, please refer to the technical report, prepared in accordance with NI 43‑101, entitled "NI 43‐101 Buriticá Mineral Resource 2019‐01, Antioquia, Colombia" and dated March 18, 2019 with an effective date of January 30, 2019, led by independent consultants Ivor Jones Pty Ltd. The technical report is available on SEDAR at www.sedar.com, on the OTCQX at www.otcmarkets.com and on the Company website at www.continentalgold.com.